Summer vacation is in full swing and many people are headed out of town to relax. During your summer fun, Greenbriar is happy to see your furry family member(s) for a stay in our luxury pet resort. We pride ourselves in keeping up on the latest medical and technological advances to keep your pet(s) safe and comfortable. One of our recent concerns involves canine influenza, a highly contagious respiratory infection that can be fatal to both dogs and cats (the H3N2 strain). There are two versions: H3N8, first noted in 2004, and H3N2, first noted in 2015. Both strains are spread through direct contact with respiratory secretions (such as sneezing, coughing, or barking) or contact with contaminated items (such as grooming tools, surfaces, hands, and clothing). Nearly 80% of unvaccinated dogs that are exposed to the virus will show symptoms. These symptoms may be mild, involving a cough for 10 to 30 days, a mild fever, decreased appetite, and lethargy. Pets may also have slight to thick nasal discharge. The more severe form involves a higher fever with possible pneumonia and respiratory distress. Canine influenza is of special concern to Greenbriar because of our large boarding facility and day care program. We continue to practice high quality sanitation procedures to avoid disease transmission between our guests and currently require the H3N8 vaccination. We will be offering the combination H3N8 and H3N2 vaccination to protect against both strains in the near future. The vaccination should be administered at least 2 weeks prior to the boarding stay or day camp for full protection. 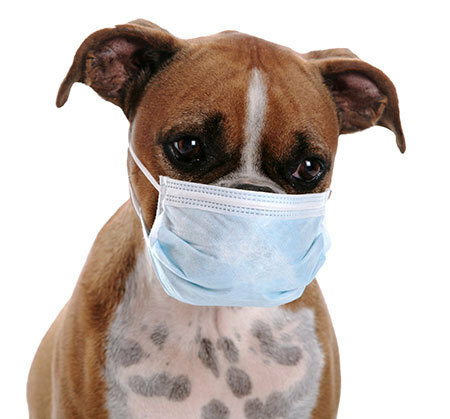 Please partner with us to keep your pet(s) safe from canine influenza. Call today to schedule an appointment for vaccination!